Aircraft: What are all the Checks For? Home > Technical Facts > Aircraft: What are all the Checks For? Aviation is one of the safest forms of transport. This is largely due to the stringent safety requirements that are imposed on airlines around the world. Maintenance checks and replacement schedules ensure that every component onboard an aircraft is checked and renewed on a regular basis. Another important aspect of aviation safety is the checklist regime. In fact, it is so successful that other occupations are adopting it. For example, the medical profession has started using checklists when performing operations; surgeons work through a list of prompts before procedures are started. Checklists are one of the most effective methods of ensuring that nothing is missed. Designers and engineers develop checklists so that pilots can work through them, in a methodical and systematic way, to check switches are on, instruments are functioning correctly and aircraft controls are placed into the right configurations. The first thing that pilots will do before taking over their aircraft is to plan their flight, usually in the flight planning centre of the airport. Here, pilots will check weather patterns, flight schedules, flight paths, anticipated fuel-burn and weight calculations. Once they have arrived at the aircraft, the Captain will inspect the aircraft externally. He checks for any obvious damage to the structure of the machine, including the wheels, tyres, undercarriage, wings and the tail plane. A look over the log book from the previous flight, which is used by pilots to log aircraft performance and anything of concern, will provide valuable information about the handling of the aircraft. After passengers have been boarded and luggage is stowed, pre take-off checks are carried out. One pilot will read through a checklist while the other performs the task, confirming that the action has been carried out. Flight controls are tested, control surfaces on the wings and tail plane are checked, and the onboard computer is checked for correct operation. The computer will tell the pilots how the aircraft is performing and will also show how much fuel is onboard and, in flight, how much is being burned. During flight, the computer constantly performs checks on everything from the pressurisation system to the temperature in the cabin. The pilots constantly monitor weather, heading, speed of the aircraft and the performance of the engines – nothing is left to chance. 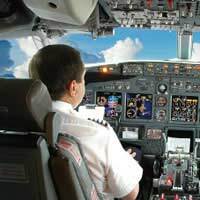 Should an error or fault be detected by the computer, the pilots have a pre-prepared checklist for most eventualities. For example, should a hydraulic system warning sign illuminate, pilots go straight to the checklist for that problem. Systematically, they work through the issue until the problem has been fixed. It has been said that landing is often the most difficult, and dangerous, part of the entire flight. Before starting the approach into the airfield, pilots will perform a pre-landing check. Once again, each point in the checklist is called out and action taken, ensuring nothing has been forgotten about. Flying an aircraft is like most things, it relies on human interaction. Anything involving human performance may be subject to error. Recent studies by health and safety authorities have concluded that most workplace accidents result from people forgetting to do certain things, possibly because they get distracted or they simply get complacent. However, the use of checklists in the aviation industry goes a long way to help prevent this type of human error. Checklists are a great way to ensure nothing is forgotten and to ensure that flying is kept as safe as possible. How Many Planes Are There in the Sky? What Keeps Such a Heavy Machine in the Air?